Former President George H.W. 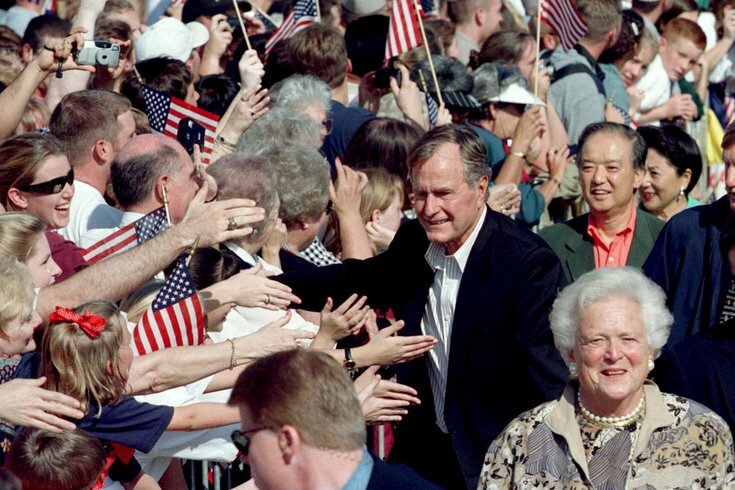 Bush and his wife Barbara arrive by train in College Station, Texas, for the opening of the George H.W. Bush Presidential Library, November 4, 1997. George H. W. Bush, the 41st President of the United States, has died. He was 94 years old. A World War II veteran who served in the Navy, a one-term president, and the father of 43rd President of the United States George W. Bush, Bush led the country from 1989 to 1993. Bush also served as Vice President for eight years alongside President Ronald Reagan, from 1981 to 1989. Bush’s presidency was defined by foreign success and domestic frustration. Internationally, the Berlin Wall fell, the Soviet Union dissolved, and he ordered military operations in the Persian Gulf and Panama while he was in office. But domestically, Bush walked back a campaign promise of no new taxes, and a ballooning national deficit sank his re-election attempt despite a largely favorable four years. Today, our nation mourns the loss of President George H.W. Bush and reflects on his lifetime of service. From his time in uniform to his days in Congress and ultimately in the White House, President Bush served our country honorably and with distinction for over 40 years. Bush also signed the first improvements to the Clean Air Act in more than 10 years, and signed the Americans with Disabilities Act into law. During his time serving in the Navy, Bush received the Distinguished Flying Cross when his plane was shot down in the Pacific Ocean in 1944. "I am sad to learn of the passing of President George H.W. Bush. While I didn't always agree with his policies, specifically around the AIDS epidemic and the failed war on drugs, there is no denying his love for our country displayed over decades of service. May his leadership and willingness to serve be an example for us all – and may his loved ones find peace during this difficult time."